Norwegian videographer Alejandro Villanueva has battled heavy weather to film a stunning time-lapse video of Trollstigen (“the Troll’s Ladder”) Visitor Centre in rural Norway. “The biggest challenge of the shoot was, as you can imagine, the weather. Trollstigen is very high up, making it very, very unpredictable”, Villanueva told the design magazine Dezeen this week. The site was created by the Oslo-based architecture firm Reiulf Ramstad Arkitekter in 2012, and the facility is widely considered a masterpiece amongst Norwegian architecture. According to Dezeen, Villanueva’s aim was to give the visitors’ an experience of the site at different times of day, and to reveal the dramatically changing conditions in the area. The visitors centre features spectacular lookout points made of steel, glass and concrete. Pools of water surround the restaurant and gallery at the centre’s entrance. In Villanueva’s film, the landscapes are a key part of the visuals. The modern shapes are shown against swaying grass moved by the wind, moments of fog and rippling water. The video is Villanuevas second instalment in his Iconic Norway series, which focuses on Norwegian contemporary architecture. Villanuevas first instalment explored the strange wooden shapes of the Snøhetta-designed Reindeer Observation Pavilion in the Dovre area. 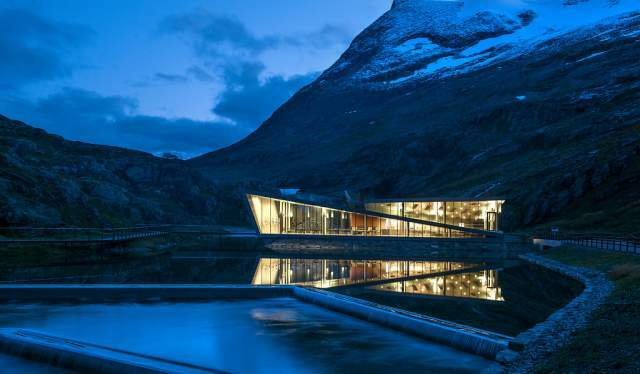 “I chose Trollstigen as my second project because of the uniqueness of the place and the sheer beauty of the building”, Villanueva said to Dezeen. Trollstigen is regarded as one of Norway’s most beautiful areas. The Visitor Centre is one of five architectural projects along the National Tourist Route Geiranger-Trollstigen, a 106 kilometre scenic road across the Norwegian wilderness. The Norwegian Public Roads Administration have now closed the road until spring. Base jumping, daring adventures and a 21-meter climbing wall. Who ever said museums were boring? This weekend the Norwegian Alpine Centre opens with exhibits, a “mountain library”. Already, you can challenge your fear of heights in one of the country’s biggest climbing walls, and enjoy a brand new movie experience.